The iStorage diskAshur is light, yet feels very solid. It is under 2cm thick, with a matt, non-slip surface and bevelled edges. The iStorage diskAshur touts itself as is the world's most secure, compact and affordable USB 3.0 portable hard drive, and with regulations around data security tightening on almost a daily basis, its 256-bit hardware encryption is an attractive proposition. To get started, the user has to enter a PIN number of between six and 16 numbers. Once this is done, the device must be connected to a USB port, the PIN entered, and the 'unlock' button pressed. A green LED will light up, meaning the device is ready for use. An external power source is not necessary, as the drive works like a flash drive - simply plug and play. It also features an inbuilt USB cable (with a longer extension if needed) which is very useful, as it removes the need to travel with messy cables. A useful feature for businesses is the Administrator Feature, which lets an administrator in the technical department control the device and have the ability to reset it at any time. The admin may also set up an account, and create as many as five extra user PINs, allowing the device to be shared between several users. The drive is light, yet feels very solid. It is under 2cm thick, with a matt, non-slip surface and bevelled edges. The surface can look a little grubby and marked after use, but the drive comes with a stretchy case to help prevent damage while on the go. It is robust, and claims to be shock-resistant due to its mounting system. The alphanumeric keypad features large, telephone-style numbers, with smaller alphabetic characters underneath. The oval buttons are adequately spaced, to prevent entering the wrong PIN number, and are wear-resistant. In terms of speed, the device performs reasonably well. The USB 3.0 port allows fast connections, that are adequate, if not super speedy, and the drive is also compatible with USB 2.0 and 1.1. Security is where the device really shines. The 256-bit hardware encryption is virtually impossible to crack, and makes this device ideal for protecting large volumes of data. Should the device be lost or stolen, the very high level of protection means the data will remain safe. It features an auto-lock feature that locks the device after a certain length of time, and after six incorrect PIN entries, the device goes into lock-down mode, destroying the encryption key and rendering the information inaccessible. The only recourse is to reset the drive. 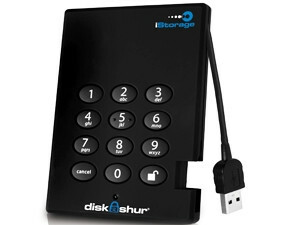 Users can also assign a self-destruct password to the drive that will reset the encryption and destroy the data. Finally, it has a Brute Force Destruct Feature that prevents hackers from accessing the drive. There are definitely more pluses than minuses here. The device is portable, sturdy and very easy to use. I love the inbuilt USB cable, and the fact that the device is virtually unhackable. On the down side, the device is not cheap, selling for around R2 800, depending on the exchange rate. It is also a little on the slow side, but again, still perfectly adequate. The biggest bug bear for me is having to add yet another password to an over-crowded mental arsenal of passwords, that I struggle with at the best of times. However, that's just me, and I would recommend the device to any business that has sensitive data that needs to be protected.